Creative Assembly’s effort at a legitimate and direct sequel to the original Alien film makes for one of 2014’s best video game experiences. Ridley Scott’s 1979 horror film Alien was a groundbreaking piece of cinema for all of the elements it creatively mixed together. After the massive popular success of Star Wars just two years prior, the appetite for science fiction had been renewed with audiences in a way that had never been seen before, and when Alien was released, it helped feed the prevailing appetite. As moviegoers would soon find out, though, this wasn’t your typical space adventure. Instead of the vehicle being the Millenium Falcon zipping between planets and keeping the Rebels one step ahead of the Empire, the Nostromo would be a haunted house in space, where no one can hear you scream. Three sequels and a couple of crossover films later, the Alien franchise is not the potent scare-machine it’s been in years past. While much of this is likely due to the release of two mediocre Alien vs. Predator films and the sadly demystifying mission of the loose prequel film Prometheus, part of this can be attributed to recent adaptations of the franchise in video games, as recent flops like the 2010 Aliens vs. Predator and last year’s sloppy Aliens: Colonial Marines can clearly demonstrate. Colonial Marines in particular was hurtful to diehard fans of the imaginative franchise, but is it possible for a new game to come along and make us feel that love again? Last week, Sega released a game by studio Creative Assembly entitled Alien: Isolation. The basic premise is pretty simple, in that it strives to get back to the purity of the franchise’s progenitor: one alien stalking you through the dimly-lit bowels of a haunted house in space. Thankfully, that overarching theme and formula is largely pretty successful. Amanda Ripley is very much her mother’s daughter, and makes for an awesome protagonist in the game. 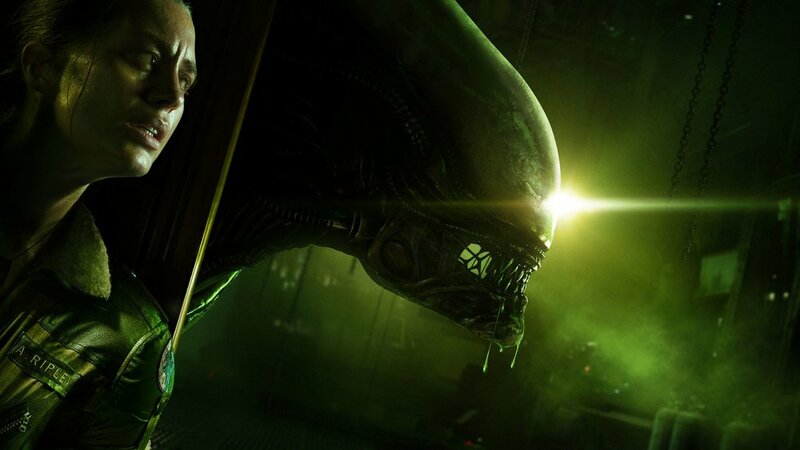 Alien: Isolation takes place fifteen years after the conclusion of the series’ first film. As we learned in the opening of James Cameron’s Aliens, Ellen Ripley had a daughter on Earth named Amanda, to whom she promised she would be back home in time to celebrate her 11th birthday. Of course, we also found out in that film that Ellen would instead be stranded for a total of 57 years in hypersleep, adrift before anyone from Earth would find her. So, by the time we pick up the story in Isolation, its unknown exactly what happened to the Nostromo and its crew, since they just mysteriously disappeared fifteen years prior. The game places you in the role of Amanda Ripley, age 26. She’s grown into a capable engineer working for the Weyland-Yutani Corporation (the eponymous “company” that lurks through all the Alien films), knowingly taking assignments in the region of space where her mother went missing a decade-and-a-half prior. The story begins when Ripley is met by a company official, Samuels, who reveals that the flight recorder for the Nostromo has been found, and is awaiting a Weyland-Yutani delegation to retrieve it on a space station called Sevastopol. Samuels insists that Ripley join he and a legal official to form the delegation and retrieve the recorder so that Ripley could find “closure” over the events surrounding her mother’s disappearance. The game’s story helps fill us in on the woman Amanda was in her youth, since all we’d seen of her was this picture from the Aliens special edition cut. She died two years before Ellen returned to Earth. When the delegation arrives to Sevastopol, the station is in complete disarray, and fails to answer any communication. Having to space walk from the ship to the station, an accident separates Ripley from Samuels, but she makes it aboard to find it dimly lit, and with groups of people huddled together for survival. It doesn’t take long before she sees that the cause of the madness is a single alien creature (which we found out in Aliens is called a “Xenomorph”). On top of that, she has to deal with rampant humanoid synthetics that have deviated from their “helpful” programming and have begun assaulting and killing people on the station. This automatically requires Amanda to use her skills as an engineer to craft useful items and do a lot to stay out of the lines of sight of the androids, some more badly behaving human beings, and of course, the alien itself. Searching the bowels of Sevastopol will take you to some very interesting places, from the central reactor of the entire station to a horrific alien nest, complete with eggs, Facehuggers, and human corpses with big holes where their chests used to be. Ultimately, Ripley has to stare death in the face – a lot – to find out the truth of what happened to her mother, what brought the alien onto the station in the first place, why the station-board A.I. won’t stop its androids from killing people, and what entity is pulling the strings of everything in an effort to get its hands on a very powerful – and potentially lucrative – artifact. Largely, the story is very solid, evoking some of the best moments of the original 1979 film while also using limited incorporation of elements introduced in Aliens to help further the intensity of the story. Written by Dan Abnett (a renowned comic book writer with memorable runs on Guardians of the Galaxy and Resurrection Man), Dion Lay, and Will Porter, it helps to emphasize that the strength of Ellen Ripley has definitely been passed to her daughter, all while featuring similar thematic exploration to the original film in regards to corporatism, human nature, and above all else, horror. I wasn’t crazy about how the story ended, though, which is basically on a cliffhanger. One lesson that it could’ve taken from the first film is in wrapping it up with a neat ending instead of relying on sequel potential which may or may not be there. Overall, as an Alien fan I found the story interesting in its allusions to past and future continuity with the films, but the ending was ultimately unsatisfying in the way it was executed. The environments, lighting, sound effects, and atmosphere feel exceedingly authentic to the vision of the original film, adding to the value of playing through the game. Right off the bat as soon as the opening credits roll, the game feels like an authentic Alien experience for one primary reason: Sigourney Weaver. The credits start playing to Ellen Ripley’s final log entry as the last survivor of the Nostromo from the closing minutes of Alien in a new recording by Weaver, and I have to admit that a few goosebumps were felt as it happened. Other major cast members from the original film, including Tom Skerritt as Captain Dallas, Veronica Cartwright as Lambert, Yaphet Kotto as Parker, and Harry Dean Stanton as Brett also all reprise their roles in the form of collectible “Nostromo logs” you can find around the station, as well as in DLC content. Beyond the authenticity of the voice cast, though, the environment and character design in this game is utterly extraordinary. The moody atmosphere of the first film is recreated very effectively on a larger scale with the station, and the lighting effects are simply the best that I’ve ever seen in a video game – ever. The way that light plays off of the environments, from your flashlight to your flamethrower, helps to create much of the sense of dread you feel in hiding from the alien either in a ventilation shaft, a locker, or under a desk. Several cast members return to reprise their roles from the original film in DLC content and “Nostromo log” collecibles, including Tom Skerritt as Captain Dallas, Yaphet Kotto as Parker, Veronica Cartwright as Lambert, Harry Dean Stanton as Brett, and Sigourney Weaver as Ellen Ripley. Ian Holm’s likeness is used for Ash, but a soundalike provides his dialogue. In addition to the “mood lighting,” the environments are extremely authentic to the world established by the first Alien film. All of the technology on this futuristic 22nd century space station solidly remains within the original film’s 1979 conception of the future, so much so that you won’t find a flat-panel monitor anywhere on Sevastopol. All of the computer screens use CRT monitors with green text on plain black backgrounds, as if the entire futuristic computer net runs on an old version of DOS. It’s amazing seeing the original film’s aesthetic brought to life in such a grand fashion, with everything from the warning labels and designed padding on the walls, to the doors, windows, and computers. Adding to the authenticity is the character design, especially for Amanda Ripley, and the alien itself. Amanda looks very much like she could be the daughter of Sigourney Weaver’s character, with an overall general resemblance while still clearly being someone new. The alien looks like it’s directly influenced by H.R. Giger’s seminal and original design of the first Xenomorph, with the only major difference being arches in the legs to make them look a little less human. Beyond that, you have a semi-translucent head with a skull partially visible underneath, and a very sleek, efficient slimy black color that makes it look truly otherworldly and threatening. The design is definitely one of the absolute best elements of the game, especially if you’re a fan of the original film, and will likely stand out most if you’re playing on a “new gen” console like the Xbox One or PS4, or on a high-end PC. The overall aesthetic really does make it feel like an authentic extension of the original film based solely on this aspect, but of course, the true test for any video game boils down to one simple thing: how it plays. The motion tracker is your best friend, but also adds to the overall sense of tension found in the game. Alien: Isolation is the first survival-horror game that I’ve played through to completion, part of the reason being that it’s very difficult for me to get scared of anything in games or movies, save for one thing: images that scared me as a child tend to still scare me today. In that respect, I figured that Isolation would have a far greater chance of scaring me since the Xenomorph was often a player in more than a few nightmares I had as a kid, and to play a game where this was the creature that was stalking me seemed like it’d have a greater chance of producing the desired effect. In short, it worked. Oh God, did it work. The game is played from a first-person perspective, but don’t think that you can jump from a game like Halo or Destinyand automatically know what to do. While you have a few weapons at your disposal early on (like a revolver and a shotgun), aiming isn’t as precise as it is in traditional first-person shooters, and the firearms will only be effective against a couple of enemy types. One of which is, most assuredly, not the alien itself. Once you actually encounter the Xenomorph early on, the best way to ensure your survival is by hiding. Having played this game on “Hard,” moving at all within the line of sight of the alien is an invitation for instant death: once it sees you, that’s it. Other enemies, like Sevastopol’s androids, are also terrifying in their own right. Since they come from a company that doesn’t make as high-end synthetics as Weyland-Yutani, whose synthetics are largely indistinguishable from people, these synthetics from a company called “Seegson” (administrators of the station, as well) are very clearly not human. They’re also very creepy, very powerful, and very hard to kill. Later in the campaign, the game changes quite a bit by giving you effective weapons to use against both the alien and against the androids. While you’ll finally be able to dispatch the exceedingly creepy androids with the “bolt gun,” the alien can only be delayed by way of the flamethrower. You can’t ever kill it. The Xenomorph itself is a powerful enemy that you can’t kill. You have to use your cunning and stealth to try and outwit the eponymous alien as it moves through the shadows of Sevastopol station. This by itself represents a fundamental and positive shift for Isolation when compared with what a game like Colonial Marines failed to recognize: Xenomorphs should be threatening, and mowing down hordes of them with a pulse rifle (as you did in Aliens: CM) just isn’t very scary. Now, hiding in a dimly lit corridor or a locker and holding your breath so that the alien can’t sniff you out? That is tense. One of the elements that curiously adds to both the game’s tension and your chances for survival is the motion tracker. Not only does it help you keep tabs on any threat you could encounter, including the alien, but it also helps out by pointing you to your nearest objective. The motion tracker is probably the most vital tool in the game’s arsenal, and it’s something that you’ll be referring to a lot. That being said, the absolute hardest element of the game to predict is the alien itself. The developers at Creative Assembly spent a great deal of time in creating “adaptive A.I.” so that the alien appears to be learning from its encounters with you. As a result, your tense and already mortified self will have to simply be ready for it: it never attacks in the same way – or place – twice. Sometimes, the missions can get a little too cumbersome, though, forcing you to immediately retrace your steps to hit a button, all the while avoiding any number of hazards that could kill you. The only major annoyance that I found while playing the single player campaign was how precise you have to be when pushing buttons on consoles or doors. In a game where time is a huge factor, with an alien breathing down your neck waiting to plunge his second mouth into your face, the last thing you want to be doing is struggling with where to stand so that you can actually hit a button on a door to get you to safety. As you make your way through Sevastopol, you have to manually save your progress at a save station like this one. Save early and often! One of the biggest elements of Isolation is that it only auto-saves at a couple of points throughout the game, mostly when you arrive at a new location. Every other time you want to save your progress, you have to hit a designated save station and do it manually. While some gamers used to auto-saving will likely find this frustrating, I actually found it quite invigorating. You find yourself asking questions like, “do I have enough time to save between now and when the alien gets in the room?” It adds to the level of tension, but in a weird way, it also gives you more control over the game in general. While it might feel like you have to take baby-steps to make progress in the campaign, it pays off a lot, especially if you structure your saves pretty well based on your inventory and objective completion. If you choose to enter a room with a save station and save your progress, you could then make your way through that room, find a lot of crafting materials or access key-cards, and then save immediately afterward in another room, preserving the items that you gained. It adds a whole other element to the gameplay and places a great deal of importance on the time spent doing tasks, because you want to survive with the best possible equipment you can have. The difference between 1 and 2 med-kits before a room of hostile people, or 2 and 3 EMP charges before a room full of androids can be a decisive factor in your progress. In a nutshell, the gameplay experience helps to instill that tension and dread in a very similar manner that the first film can instill in a first-time viewer, and no other game in the franchise has ever been as successful as this one in recreating the emotional experience of the film in a video game environment. Beyond that, there’s a lot of content here, and since you have to be very careful, it’ll take a lot of time to complete. I finished the single player campaign on hard difficulty after 36 hours. In a world where most video games don’t take longer than 12-14 hours to complete, that’s pretty awesome. It’s probably best to just not let an android get this close to you, but if it has to happen, don’t try and rely on your fists. A shotgun and especially the “bolt gun” work a lot better. Alien: Isolation is a blast. It’s a different kind of blast in that it’s not something that you can run and gun your way through. It takes patience, alertness, and a desire to see the end of the story. The atmosphere is second-to-none, the story is an interesting tread into previously unknown territory in the Alien universe, and feels like a legitimate addition to the mythology of the film series in a way that the other games simply don’t. If you come into Isolation expecting “Colonial Marines but better,” then you’re in for a rude awakening. If you want a game that evokes the original film in grand fashion and in a way not seen before, with an interesting original cast and story, and you’re patient and like elements of stealth and survival gameplay, then it’s possible to learn to love Alien games again. Isolation nails what makes the first film a unique experience, and is a must-play for horror game lovers, sci-fi fans, and Alien franchise fans alike. A copy of this game was provided for reviewing purposes by representatives of Sega of America.